Bravely Second is an incredibly hard game to talk about without sounding like a complete weirdo, and it gets even worse when you start throwing in some of the game’s terminology, such as Brave points and Abilinking. There’s certainly a significant knowledge barrier here, but persist and behind all of that bluster you’ll find a solid adventure. Set two and a half years after the events of the original, Bravely Default, Second follows the tale of Crystalguard Cavalier Yew, who sets out to rescue Pope Agnès after she’s abruptly kidnapped by the evil Kaiser Oblivion. Betrayal, peril, romance, and plenty of fighting follow as you meet up with new and old characters on your journey. 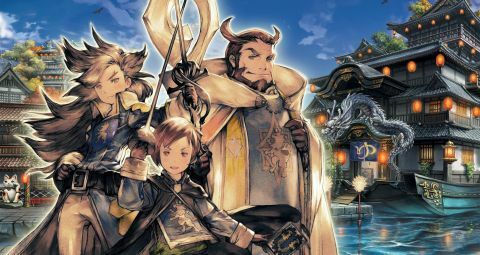 It’s a straightforward setup, but the lore of the world of Luxendarc runs deep – while the game does a good job of briefing you on the story, you’re still going to miss out on a lot if you never finished the last game. It also shares a lot in common with older Final Fantasy titles, including item names such as Phoenix Downs, and a plot following the adventures of four warriors of light and their escapades with crystals. The battle system is almost exactly the same as before and is the real highlight of the series. You can choose to attack as normal, Default on your turn to briefly boost defence and save up a turn, or Brave by using up multiple turns at once. It’s a really neat take on turn-based combat that adds a new tactical layer to proceedings. Do you charge forward multiple times to hit heavily but then risk not attacking back for several turns, or do you bide your time and play defensively until you’re ready to strike? There are also 30 Jobs (AKA classes) to choose from, which you’ll unlock as you go. You’ll start out a simple Freelancer who uses sword strikes to attack and can learn useful abilities such as Examine to learn about the monsters you face, but you’ll soon be able to wield powerful elemental magic with the Wizard class (who, usefully, can cast defensive as well as offensive spells), or equip multiple weapons at once as a Charioteer (basically a horse-inspired warrior). You’ve also got your standard Knights, Thieves, and White Mages, but things get a little odd when you reach the Patissier (who can create sweets that dish out various dangerous status effects such as poison and paralysis) and the Catmancer (who learns attacks from enemies and uses them by absorbing items). Despite there being so many of them, each of the Jobs feels unique and well-balanced. There’s no ‘best’ way to set up your party – the system’s flexible enough for you to choose your favourites. The fighting has been tweaked since the last entry to make things simpler. You can now save presets to make switching Jobs far easier, and if you kill all of your opponents in one turn you can challenge a second wave straight away for a greater reward, which comes in handy when you’re trying to boost your level. While these things definitely help streamline proceedings, however, it still feels old-fashioned in some ways. While there’s less of a grind this time around for normal levelling, you will still find yourself repeating your footsteps to make the most of the new Jobs. Having such a large range of different fighting styles to experiment with is a joy, but unlocking new abilities for them is tough going, as you have to tediously level each one from scratch for every individual party member. You can power through without the need to switch Jobs too often if you prefer, but if you want to fully test what your party is capable of, you’ll have to put in a lot of work. But while the world is beautiful and the battle system is fun, Bravely Second falls down when it comes to its dialogue and characters. You’ve got your typical melodrama in spades, but every now and then it tries to shoehorn in comedy and odd pop-culture references. There’s nothing inherently wrong with being goofy or cracking a joke – it can help break tension and reveal softer sides to otherwise hardened warriors – but Bravely Second just never does it well. It picks the oddest moments to have a skit about cake, and at one point it even breaks the fourth wall by having Yew accuse you as a player for judging him as a coward. These things are intended to poke fun at well-trodden tropes and clichés in anime and other games, but it relies far too much on you being in on the joke. Its humour isn’t universal, so instead of it coming off as a cheeky bit of fun, you simply feel yourself breaking away like battenberg in bathwater. Magnolia is equally peculiar. While being a warrior from the moon does probably come with an inherent degree of weirdness, for some reason everything she says is given a flourish of French babbling at the end of it. It’s meant to give the impression that she’s exotic, but merely adding an accent isn’t enough to define an entire personality trait. It also doesn’t help that if you’ve ever picked up a smattering of basic French, you’ll quickly realise that she’s pretty much just repeating herself like a mad woman. It’s the accumulation of these little things that lets Bravely Second down. It’s got the right parts for a fine role-playing adventure, but all those petty annoyances just keep taking you out of the moment. It feels very much like you’re playing it through a sheet of glass – sure, you can see and appreciate how exquisite it is, but you can’t ever truly connect with it. This is still a great little RPG with one of the best twists on turn-based combat in recent memory, so if you’re a fan of the genre or enjoyed the original Bravely Default there’s still a lot to love here. Just don’t expect a smooth adventure or a story to remember. This review also appears in GamesMaster Magazine. Description The sequel to Bravely Default.